The central Moscow mosque was inaugurated on September 23. 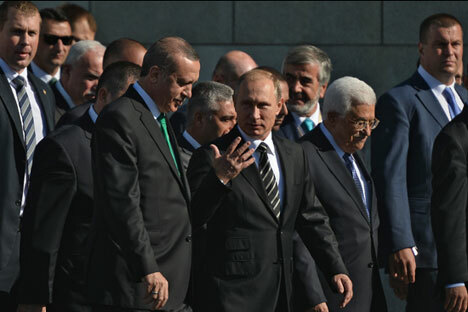 Turkish President Recep Tayyip Erdogan, Palestinian leader Mahmoud Abbas and Kazakhstan President Nursultan Nazarbayev joined Russian President Vladimir Putin in inaugurating the newly reconstructed central Moscow mosque. "I am sure that the Moscow Cathedral Mosque will not only help unite Muslims, but bring people of other religions together to do good things,” Putin said at the opening ceremony. He added that the Koran teaches people to outdo each other in good deeds. The Russian president said it was fitting for the reconstructed mosque to be in the capital of a modern, multi-ethnic and multi-religious country. The mosque, which is the second largest in Russia can accommodate up to 10,000 followers, and was built with funds from many Muslim countries. “This is a great event in the life of Muslims in Russia,” Putin said, after meeting Abbas. Muslims make up around 14 percent of the Russian population.